Someone recently asked me what changed in 2018. I hardly remember that far back. Personally, my old dog died. Do you know what beer goes with losing a dog? Whisky. But, there was also joy as I gained a grandson who licked some beer off my finger and liked it. In beer land, the definition of “IPA” seems to have become more malleable than ever, which may be worth discussing some day. Locally, the nano-brewery looks like the wave of the present, if not the future. Think Miel, Parleaux Beer Lab, and Courtyard Brewery, for example. Does that mean the market is getting saturated? All I know is that I can’t keep these breweries in business all by myself, try as I might. For now, though, good beer is flowing all over town, and that’s cause for celebration. Here’s a look back at a couple of events from the end of the old year as we look forward to more in new one. December featured a couple of enjoyable beer “research projects.” The first was the Crescent City Home Brewers’ Winterfest bash at the new Deutsches Haus on Bayou St. John. I went with my youngest daughter and her friends. We had our tickets, so we showed our IDs and got our wristbands. As I handed over my brand new my REAL ID drivers’ license — obtained with great patience at the Hahnville OMV – it occurred to me once again that something is wrong with requiring a person who is well past 21 to show a valid ID in order to buy beer. Alas, you don’t get to be 20 again when your license expires. The valid ID requirement has taken on a life of its own, beyond discouraging underage drinking (at least underage drinking in public). Minutes of painstaking legal research revealed that it is not an offense to serve beer to a 50-year old woman whose driver’s license expired last Tuesday. (Look it up in Title 26 of the Louisiana Revised Statutes.) On the other hand, a strict ID requirement provides the seller with an iron-clad defense to a charge of selling alcohol to a minor, and it removes discretion from busy staffers who might not always judge age rightly. So when you get carded at the grocery store or the bar, I’m sorry to tell you that it’s probably not because you look astonishingly young, but rather on account of the vendor’s bureaucracy-induced over-cautiousness. Still, for many consumers, the ID requirement is a way for paranoid cashiers to keep drink out of certain hands. Meanwhile, back at the Haus, the food was in the big common room where there was space for plenty of tables, a band, and a small dance floor. The fare was what one expects at the Haus – bratwurst, sauerkraut, red cabbage, and … chorizo? The Haus has a big and attractive bar where you can get the popular German drafts you’d find at the Oktoberfest, but we blew right by it and headed outside to the home brews. The weather was perfectly un-wintery, mild and dry, good for wearing either shirtsleeves or a jacket. The home brew taps were in banks of eight or so, scattered in several places around the lot. There was plenty of elbow room, and nobody hogged the taps. Neat signs plainly identified and described the beer at each tap. I first made sure to try the beer made by my friend from the Algiers Ferry, Marcel Charbonnet, home brewer and biologist. His four beers were on a tough-guy theme. The Muscles from Brussels was a Belgian Blond and reference to Jean-Claude Van Damme. Hulkamania, was billed as a “big dank hopbomb” but tasted better than it sounded. My two favorites of his were I Pity the Fool (Mr. T.), an American brown ale, and a big American imperial stout named for Shaft. I also looked for anything that might resemble an English style ale because those are not easy to find these days. The first one I tried was disappointing, having a trace of the banana-like flavor you might expect in a wheat beer. Jacob Landry, who knows about brewing, later told me that odd esters come out when the beer is not fermented at the proper temperature, a common hazard of home brewing. Another British style brew, called Bedknobs and Broomsticks was more to my liking. But the description was curious. The brewer invited the drinker to imagine being in a London pub in the 1940s. The time and place admittedly evoke a romantic image of pipe smoke, beer, a place of warm refuge from a chilling fog, and a sturdy sort of optimism in a gloomy time. 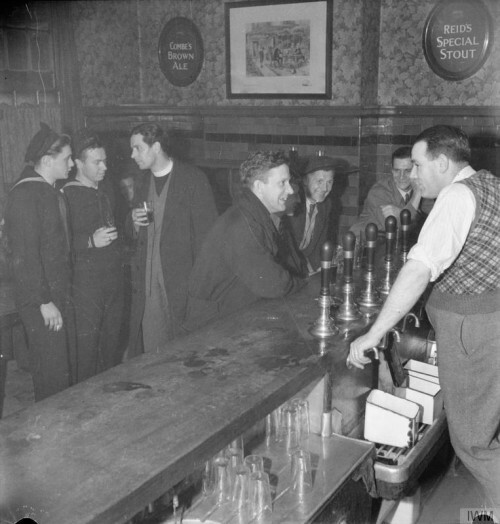 (The Reverend Joseph Stephens chats to American sailors in The Royal Albert, Silvertown, East London, 1944. Copyright Imperial War Museum; Used with permission). 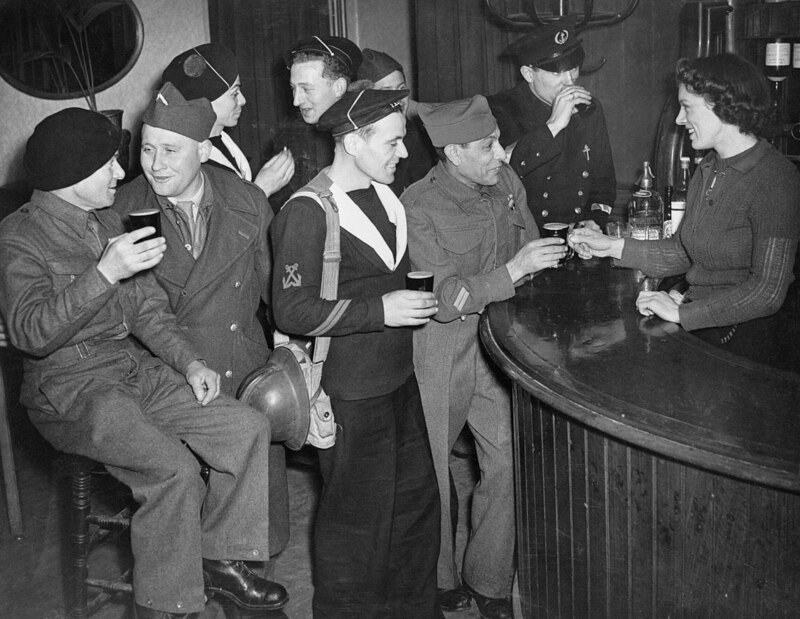 But having read about World War II (1939-1945, in case you missed that history class), I wasn’t sure of the beer-appeal of war-time London. During and after the war, food scarcity affected the brewing industry. And of course, in the early 40s, London was being bombed on a nightly basis in what became known as the Blitz. Perhaps there was the sly joke, because in other circumstances, I might have enjoyed getting “blitzed” on this beer. Instead, I showed laudable discipline and settled for a modest few ounces so I could taste a couple of other interesting brews. The most memorable of the others was an in-your-face jalapeno beer that managed to be pleasant despite lacking any pretense of subtlety. It almost made me sneeze, but I wanted another one. The crowd was large and festive and seemed to be enjoying itself as much as the beer. I chatted with strangers and had a long conversation with a guy I hadn’t seen in years. December is way off, but plan to attend Winterfest next year. And don’t pass up an occasion to visit the new Deutsches Haus. 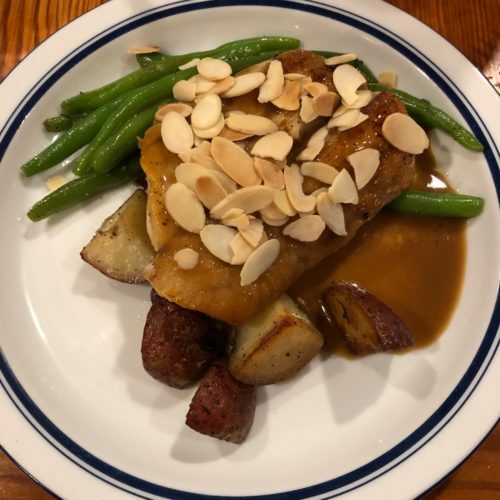 The second research project was more genteel affair ‑‑ a beer dinner at the Freret Beer Room. I got invited through my friend Gary Krasnow, an architect who does some work for Eli Gay, the Beer Room’s energetic and imaginative owner. Chef Charles Vincent paid homage to some signature New Orleans dishes, and each course was paired with a craft beer. It cost $45 for the food, plus another $14 for the beer, plus tax and tip. To start, a perfectly fried oyster with melting brie on top appeared with Southern Drawl from Great Raft. The oyster was so exquisite that I almost forgot about the shrimp remoulade that also came with his course. Turtle soup was paired with Port Orleans Slackwater Brown. 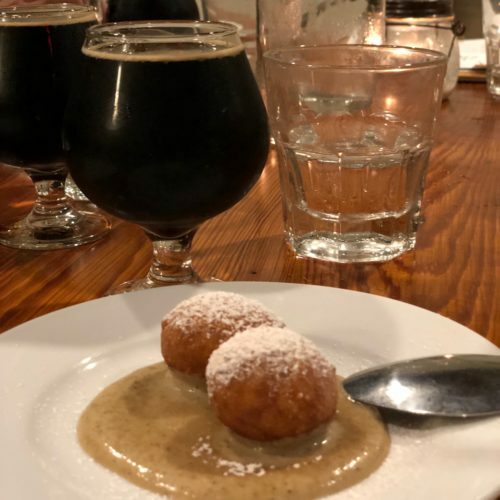 The trout amandine came with Second Line’s Saison Named Desire, while dessert featured Parish’s Irish Coffee Stout with a couple of mini-beignets wading in café crème Anglaise. 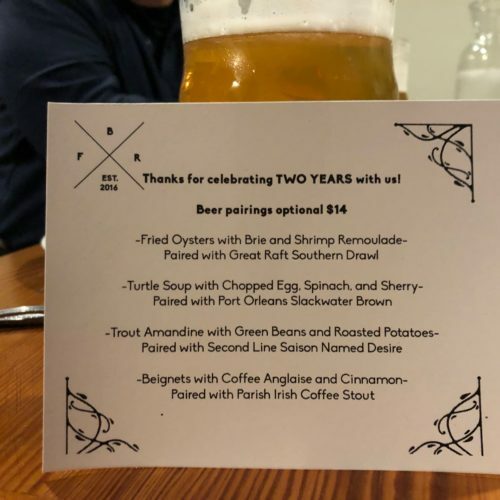 The only thing I would have changed is to have served the semi-funky saison with the oyster and brie, and the crisper Southern Drawl with the trout. And they could have served me about 10 more of those oysters, none of which lasted long enough to be photographed. The chef got a well-deserved standing ovation. Visit the Beer Room and the newly opened craft beer store, the Freret Beer Annex, and while you’re there, ask about the next beer dinner. It may be too late for the beer dinner on January 29, featuring beer from Southern Prohibition; but there will be others. The Pidgen Town Brewery is open and brewing in conjunction with Ale on Oak. Read more here and here. The iconic New Orleans craft beer pioneer, New Orleans Lager & Ale, better known as NOLA Brewing, celebrates its tenth anniversary in February. Learn more and get tickets here. February 8 is Nuit Belge. Frankly, I don’t know much about this royal marriage of beer and food, because it’s been too pricey for me. But it’s a big deal for many beer geeks and foodies, and if anyone wants to take me and pay my way I promise to behave and be good company. NBC reports that the government shutdown over the border wall affects craft beer brewers who need government approval for a variety of things, from permits to labels. Urban South was one of more than a thousand breweries nationwide to team with Sierra Nevada to brew Resilience (an IPA tending toward juiciness), to raise funds for relief from the devastating effects of the Camp Fire in California last year. Want to read more about the recent year in beer? Here are Beer Advocate’s top 20 stories of 2018. And here are links to Beer & Brewing Magazine and the Facebook page of Louisiana Craft Beer Magazine, a new quarterly publication sponsored by the Louisiana Craft Brewers Guild. My idol, Nora McGunnigle is the new editor of Louisiana Craft Beer Magazine, and you can always learn about everything new and beery from her by following Nora McGunnigle on Facebook. Please inform, amuse, advise, question, or chastise me at kevsbeerthing@gmail.com. The food photos were by Joseph Tate.